When you think of a memorial to the late Tupac Shakur, many things may come to mind such as a painting, statues or a garden. You probably would never think that a 5 foot alligator named Mr. Teeth whose sole job was to protect your pot was one of them. 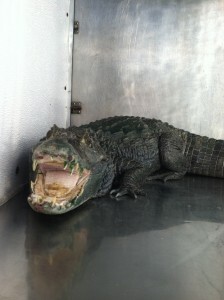 The Alameda County Sheriff’s deputies raided a local home in Mount Jasper and were surprised to not only find 34 pounds of pot, but more interestedly, they found a 5 foot-long (although ill), alligator that was used to protect the owner’s stash. The owner, Assif Mayar said that he purchased the alligator back in 1996 “to commemorate the death of rapper Tupac Shakur” (sfgate.com,2013).